These W.O.W. 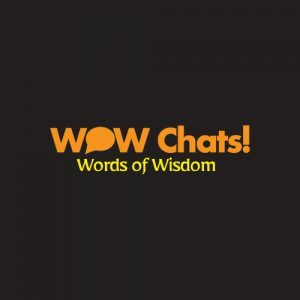 Chats are candid, clear, and concise Words of Wisdom gathered from people I respect and admire: professionals and friends I have connected with throughout my travels across the globe. This compilation is Part 7 of 7 of the 2018 interview collection of brilliant and binge-worthy tidbits of insight, information, life lessons, and more. These W.O.W. 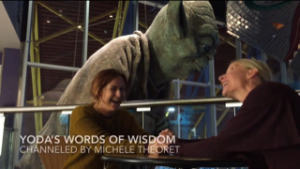 Chats are candid, clear, and concise Words of Wisdom gathered from people I respect and admire: professionals and friends I have connected with throughout my travels across the globe. This compilation is Part 6 of 7 of the 2018 interview collection of brilliant and binge-worthy tidbits of insight, information, life lessons, and more. These W.O.W. Chats are candid, clear, and concise Words of Wisdom gathered from people I respect and admire: professionals and friends I have connected with throughout my travels across the globe. This compilation is Part 5 of 7 of the 2018 interview collection of brilliant and binge-worthy tidbits of insight, information, life lessons, and more. Your pelvic floor plays an important role not only in bladder, bowel, reproduction and sexual function, but also in hip function, breathing, core strategies, standing balance and more. The pelvic floor is also known to be intimately connected to the feet and the floor of the mouth. Pelvic health issues related to these many roles are commonly poorly addressed or often left untreated in both women and men. Canadian Physiotherapy Congress Includes Yoga Therapy! 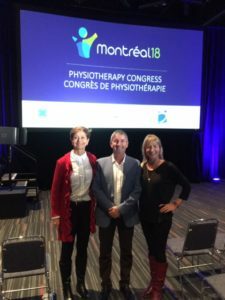 History was made in November 2018 in Montreal, Canada at Canadian Physiotherapy Association (CPA) Congress where we (Neil Pearson, Diana Perez, Shelly Prosko – physiotherapists/yoga therapists) presented Yoga Therapy: An Integrative Biopsychosocial Approach to Enhance Physiotherapy Practice to a conference room filled with physiotherapists from across the country who were interested in learning more about yoga and its integration into physiotherapy practice. We also presented a full day pre-congress course on this integration with a focus on chronic pain, musculoskeletal and pelvic floor rehabilitation and wellness care. Well folks, I get up close and personal with Diane Lee, one of the world’s most influential physiotherapy educators. In this W.O.W. 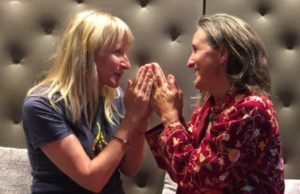 Chat episode, I ask Diane a personal question and she graciously accepts the invite and shares her story of struggle and how yoga (including the meditation aspect of yoga) has been instrumental on her healing journey and helped her reconnect with her Essence. She realized that she could still be well, even with a physical injury. She discusses the irony of a physiotherapist such as herself experiencing what it’s like to have unexplained pain and how it helped her be more empathetic towards her patients. This was a great chat filled with insights and inspiration. Self-care is a popular term these days. I believe the meaning has been watered-down or misinterpreted to the point that when we say ‘I’m going to take some time for some self-care’ it often implies a time-out perhaps for some solitude, rest or indulgence in something that we love or think is good for our health. But many (including myself) have experienced the dark side of this so-called ‘self-care’ movement. When self-care becomes another item on your list of things ‘to do’ or an added pressure or expectation in an unrelenting pursuit of better health, it can become the antithesis of self-care and I think we are missing the whole point of it. To me, self-care is more of an approach; a philosophy and a dynamic process, that guides your every moment and is constantly changing. Sure, self-care may include rest, solitude, stillness, social connection, laughter, physical activity, time in nature, music, play, dance, boundary setting, a difficult and honest conversation, a fun conversation, meditation, crying, a warm hug, silence, being sad, being angry, effort or service; but these activities aren’t ‘self-care activities’, they are just activities. Self-care is about when and how you choose or allow these and how you respect your own needs during the process. This self-care process involves awareness, attention, self-reflection, insight, courage and action. 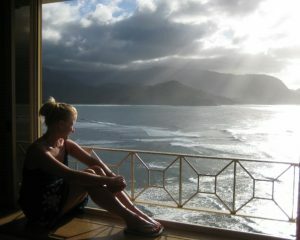 I do believe there is one consistent feature of self-care, and it is self-compassion. Self-compassion includes having a clear non-judgemental awareness of your needs and having the courage, kindness and love to meet those needs, including asking for support when needed. In summary, I try to think of self-care as an ongoing process of self-compassion and way of life, and not a list of activities to check off. (And for the record, self-care (redefined) and self-compassion are not selfish; rather, they are essential so you have the inner resources available when required to care for and serve others). Stay tuned for more on self-compassion and check out Neff & Germer’s research! These W.O.W. Chats are candid, clear and concise Words Of Wisdom gathered from people I respect and admire; professionals and friends that I have connected with throughout my travels across the globe in 2017. This compilation is Part 4 of 4 of the 2017 interview collection of brilliant and binge-worthy tidbits of insight, information, life lessons, and more. 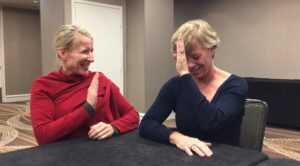 Jules Mitchell, highly respected biomechanist educator for yoga teachers, says, “I love when I go teach and students question me.” Learn what Jules thinks is lacking in the yoga community and hear one piece of advice that she has for all teachers (that can be applied to humanity, too)! Click HERE to subscribe to Prosko PhysioYoga Newsletter for updates and resources!